"Outstanding, from beginning to end!" Outstanding, from beginning to end! "Dave Wirtz was very helpful and went the extra mile to find the right solution." Dave Wirtz was very helpful and went the extra mile to find the right solution. "Dave and crew were on time, polite, knowledgeable and just great to work with!" Dave and crew were on time, polite, knowledgeable and just great to work with! "Michael and crew were great. Difficult job and they performed above expectations. Thank you." Michael and crew were great. Difficult job and they performed above expectations. Thank you. "The A-team at its best. Ten stars for Milton and Daniel!" The A-team at its best. Ten stars for Milton and Daniel! I’ve seen Ohio Basement Authority on TV, then I met with Dave who was helpful and knowledgeable. The crew came right in and went to work. Getting it done in one day is what I liked! I chose to work with Ohio Basement Authority because the company was quick to come to my house and take care of my problem. David was wonderful. He educated me on my basement problem and what I needed to fix it. I definitely would recommend Ohio Basement Authority if you are having basement problems. They are very professional and caring. You were recommended to me by a plumbing company, and I chose to work with you just because of the good comments from past customers. I’m very well pleased with everyone. It started with David Wirtz and continued with the rest of the staff. I think that the professionalism of David Wirtz is to be commended. He certainly knows what he is talking about. The installation crew arrived on time, was courteous, and their cleanup was excellent. There seems to be very high standards and much integrity with your company. I will use you again. We’ve seen Ohio Basement Authority’s ads on Channel 10, and we chose to work with the company because no one else seemed interested in helping us solve our issue with water coming into our home. The office staff got the ball rolling, and Dave was excellent in laying out our options. I received several calls from the foreman about when they would arrive from a morning job. He was great, and the crew could not have been better. They were very efficient. Helen W. from Columbus, OH, called Ohio Basement Authority because there were puddles of water in one corner of the basement. In this video she speaks about her experience with the company. "They came, they did the job, it was good too. The best!" Mr. Dave Wirtz is helpful, knowledgeable and personable, and he is the primary reason I chose your company over others. The crew also was very courteous. They talked me through the process, showed me how the end result was working and answered all my questions. We chose to work with Ohio Basement Authority because of the price for repair and quick project turnaround time. Dave Wirtz was great to work with and has excellent communication. My step-son worked for Ohio Basement Authority, and I chose to work with the company because of the cost and friendliness of Dave. Dave Wirtz was more than helpful. He did a great job explaining exactly what needed to be done. There was an issue with the date that the Geo-Lock Wall Anchors were scheduled for. I called and spoke with Dave, and he said it would get worked out and that someone would be there to install it. Don’t you know, Dave himself and Ryan came out and put the wall anchors in on a Saturday! I was more than pleased that he did that for me. I chose to work with Ohio Basement Authority because your repair process makes sense, and your representative, David Wirtz, gave me an excellent basis for making the right decision. His presentation was outstanding! David was friendly, informative, and knowledgeable. He did not apply any “high pressure tactics,” he let me take in the info and enabled me to make an informed decision. Your installers were professional and polite. They got right to work, made no excessive noise, and took the time to do the job right. I got much more than I expected! You can be sure that I will recommend your company. Rich and Dave Wirtz are amazing, and I 3,000% put my trust into them for future projects. Dave Wirtz has worked in many sectors of the construction and soil industries, including general home repair/building, soil sampling, and soil decontamination. He also spent time as a United States Marine. Dave is excited to work at Ohio Basement Authority because he likes to help people, and he has a unique skillset and understanding of ground soils and their composition. He also looks forward to meeting new people and finding solutions for the problems people face in their homes. 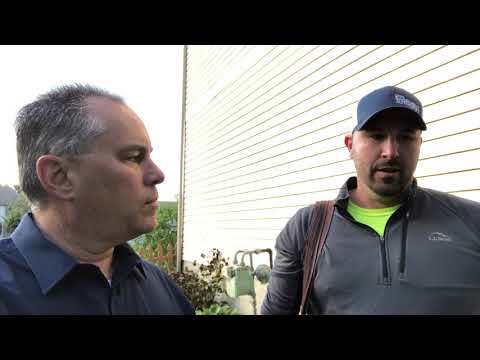 As an inspector, Dave travels around central Ohio to educate customers on their repair needs, Ohio Basement Authority's patented products, and how we can help them create safer and healthier living environments. Outside of work, Dave enjoys shooting sports, riding Quarter Horses, and fishing. He also loves spending time with his family, especially during the holidays. Dave is a creative, hard-working, and patriotic individual. He believes that the smallest detail can be the difference between success and failure. He intends to bring his wide skillset, and this particular attention to detail to work at Ohio Basement Authority every day. After living in their house for 18 years, homeowners in Pataskala, OH, started to notice some issues in their basement. One of the walls was cracking and appeared to be slightly tilting inward. The owners didn’t want these problems to worsen to the point of serious damage, so they began to research how to best address these issues. They came across Ohio Basement Authority’s website, and they were eager to contact us to learn more about how we could help them. They met with Inspector Dave Wirtz who evaluated the condition of the wall. Dave then recommended one type of our many reliable foundation repair solutions. Foreman Jose De Jesus Tellez Ortiz and his crew then installed several Carbon Fiber supports along this wall. These heavy-duty supports firmly adhere to the wall to reinforce it and stabilize it in its current position. These strong supports also prevent any further cracking or inward bowing on the wall. These supports may not appear aesthetically pleasing, but they can easily be concealed with paint or other basement finishing materials. The owners now have peace of mind knowing this trustworthy solution has helped ensure the safety and structural integrity of their home. During the last several years, homeowners in Westerville, OH, have been monitoring a potential structural issue outside their home. They noticed a retaining wall outside their basement walk-out was beginning to fail. It was cracking and slightly tilting inward. The homeowners were not only concerned about their safety, but how these issues could affect the future resale of their house. They were motivated to contact Ohio Basement Authority after seeing our TV ads. After meeting with one of our inspectors, the homeowners were equally excited for one of our crews to fix these problems for good. First, the crew excavated the earth outside the retaining wall down to the wall’s footer. The wall was then pushed back to as plumb as possible. Then, two Geo-Lock Wall Anchors were installed to further straighten and stabilize the retaining wall. Wall Anchor Covers were placed over the visible anchor plates to conceal them, and all cracks were repaired and filled. The homeowners are pleased this reliable repair solution has helped enhance the safety and appearance of their home. During the three years that they have lived in their house, homeowners in Powell, OH, have used the partial crawl space just off of the basement for storage. They recently began to notice it felt damp in the crawl space. The area also lacked proper lining to cover the gravel floor, and some of the insulation was starting to fall from the walls. The homeowners wanted to have a healthier area to store their belongings, and they wanted to ensure the health of the crawl space and home for when they choose to sell the house. They started to research how to best address these issues, and then they were eager to contact Ohio Basement Authority after learning more about our company online. They met with one of our inspectors who presented them with the perfect permanent solution. One of our expert crews then encapsulated the crawl space in CleanSpace liner. Similar to swimming pool liner, CleanSpace is thick and durable. It seals the crawl space from the earth, prevents vapor and moisture intrusion, and helps insulate the crawl space. It is tough enough to crawl on, and its durability is enhance by the thick drainage matting that was placed underneath it on the crawl space floor. The homeowners are happy to now have a healthier crawl space and home because of this reliable repair solution. Ask the Expert: Hows Does Soil Affect Your Foundation?